The association has been advised that former Sergeant Malcolm (Les) Tolley passed way on the 7th of August, aged 78, following an eight month illness with Pancreatic Cancer. Les first served with the Yorks and Lancs, form 1956 to 1958, then transferred to The ‘Dukes’ and served with them until 1979. During his time with 1DWR Les served in the Drums Platoon. 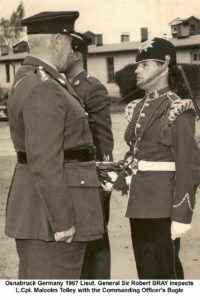 In 1967, during the Battalions tour in Osnabruck, Les was presented with the Commanding Officers bugle. All former regimental members are welcome to attend. The family has advised that flowers are not required, but donations will be gladly received at the service for Help for Heroes and The Macmillan Cancer Support.